Edwardian French couple. Dagoreau RPPC. Private Collection. 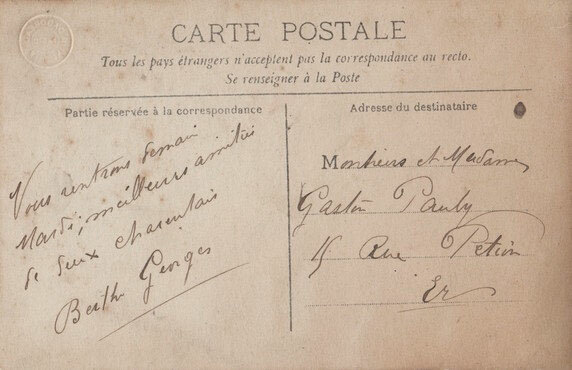 A gorgeous couple mailing from Charente, France. Bertha is sporting the “Gibson look” so in vogue at the time with the extra small waist and pinned hair in a loose bun. Her husband is classically dapper in the matching starched frock suit with the creased pants and high collar. The photographer logo is embossed on the bottom right. Postcards were mailed so quickly they were the equivalent of today’s text messages. We’re coming home tomorrow Tuesday. To cherished friendship. Best wishes from Charentes. This entry was posted on Thursday, April 30th, 2015 at 8:33 pm	and tagged with 1900s, Charente, Dagoreau, europe, France, Gibson look, retro fashion and posted in Couples, RPPCs. You can follow any responses to this entry through the RSS 2.0 feed. At one point here in the UK there were up to five postal deliveries a day, I read in one postcard book that women used send their orders to the local butcher for a same day delivery, beat that Amazon lol. Another lovely card, I particularly like her blouse with the high collar, I have a Maude Fealy card where she is wearing something similar. I read about that! It’s amazing to think they could send a postcard for an invitation in the evening and they could receive a reply the same day! At least in London! Hahaha! If you do please have your wife take a picture! Lol! That’s a whole new blog!